The Raspberry Pi made experimenting with computing hardware and software more accessible to millions, and now a new project wants to take that concept further with an even smaller developer board that runs full Linux and has built-in Wi-Fi, all on a circuit board just 1/4 of the size of the Raspberry Pi. The Onion Omega is a dev platform designed to give software developers an easy way to create Internet of Things applications without having to build their own hardware from the ground up, or modify other products to suit their own needs. The Onion Omega is designed to be easy to add to existing hardware projects, providing them with Wi-Fi capabilities, as wells a Linux-based OS, 16MB of local storage, and 64MB of DDR2 400MHz RAM, as well as pins supporting USB 2.0 and 100Mbps Ethernet. Onion Omega’s creators, which include core team members located in Boston, Toronto and Shenzhen, were looking for a way to build IoT devices easily without having to learn programming beyond their core experience of web dev languages, with easy expansion capabilities and built-in cloud features. Onion Omega ships with a number of expansion module options, and it also offers free access to REST APIs and a number of other connected services out of the box. There’s even an ‘app store’ of sorts offering up easy ways to reprogram the board for use with different types of hardware. 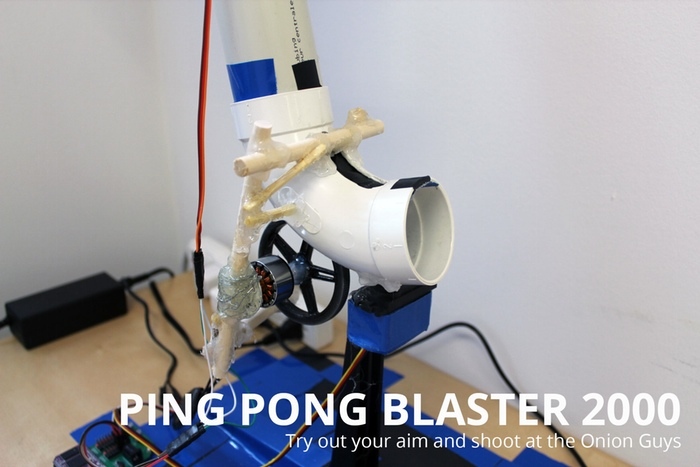 Already, there are a number of live examples of projects made using the Onion Omega, including this Ping Pong blaster that anyone can queue up to aim and fire using the company’s web-based interface. Clearly, people are interested in what Onion Omega aims to accomplish: The project has already garnered around $55,000 in backing on Kickstarter, nearly four times the $15,000 it set as its original goal. If you’re looking to pre-order, you can pledge $25 to get both the Omega and the Dock, and for only $10 more you’ll get an expansion module of your choosing, too. The target ship date is August 2015 for the first Omega units going out to backers.